Review of Alonzo King's LINES Ballet at Meany Center for the Performing Arts. Written by TeenTix Press Corps Newsroom Writer Annika Prom, and edited by Teen Editorial Staff Member Anya Shukla! Throughout the world, ancient languages are fading away at an alarming rate. Alonzo King’s Figures of Speech, performed by his LINES Ballet company, aimed to preserve these moribund dialects by conveying the struggle of maintaining each language’s culture. The ballet recently shared pieces of these dialects, which range from the provincial Hawai’ian language spoken by 27,200 people to the extinct Selk’nam language that has no known native speakers, with the Seattle community. Bringing his San Francisco-based ballet ensemble to the UW’s Meany Hall, choreographer and artistic director Alonzo King collaborated with slam poet and linguistic advocate Bob Holman to present his latest pièce de résistance, Figures of Speech. The LINES Ballet explored the power behind lost languages, guiding the audience on a touching trek through the sound, movement, and shape of aboriginal languages. The piece began with the curtain opening to reveal a blue trail of light traveling across the stage, followed by one dancer. Sounds of an endangered language faded in and out until the audio assumed full volume, creating a push-and-pull dynamic that symbolized the dialects’ flickering existence. The lighting then transitioned to a yellow hue as a stream of dancers sauntered out to the tune of rhythmic clacking and a wood pipe, cementing the concept that expressing a language can appeal to multiple senses. During this act, the dancers stepped to the defined beat in simple, linear interactions, contrasting the way the performers would respond to the later music using the geometry and weightlessness of their bodies. The duality of these two types of movement communicated the range and versatility of expression found within languages. Alonzo King LINES Ballet in Figures of Speech. Photo by Chris Hardy. Toward the latter half of the ballet, another male dancer opened an act by jumping into the scene accompanied by the soundtrack of thunder. 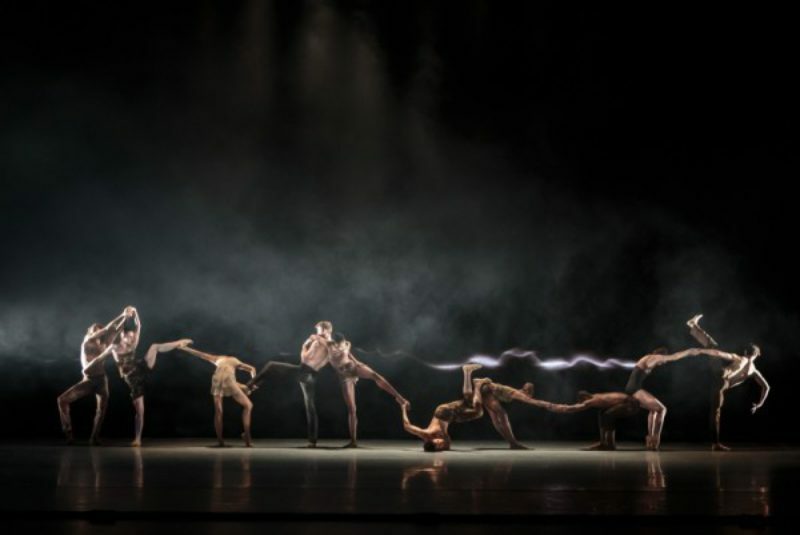 The lighting adopted a soft yellow color when he began to dance, while the other performers formed geometric positions with their bodies to create the image of wisps of thunder. As well, each performer demonstrated mastery in control of their bodies. In one act, a female dancer grasped onto a male dancer’s shoulders and lifted herself off the ground as he drifted toward the edge of the stage, showing her ability to maintain weightlessness as she hardly skimmed the floor. From the music to the costumes, Figures of Speech set the audience’s attention on its purpose—expressing “the most musical languages” through movement, as King said in a pre-show address. The background music offered deep bass and echoing chimes of metal motifs, which established the audio as a light supplement to the dance, which was the main body of the performance. Meanwhile, the ballet appeared monochromatic in regards to the subtle clothing of the dancers and plain white stage, attracting one’s eyes to the stories told by the dancers. Hints of color shone through in the warm, earth-toned costumes, conveying the idea that a visual and audible language also connects to nature, as they both must be shared and sustained by communities in order to survive for generations. Additionally, the dance, a medium of communication, worked alongside the languages to keep a culture alive. The very interactions between the dancers created a visual dialogue that preserved the featured dialects. Although their movements seemed abstract and consisted of a basic unit—the line—the dancers made use of their available space to make both modest and extravagant statements about moribund languages. Though only a microscopic portion of the population can speak these dialects, the Figures of Speech ballet preserved them through performance. The craft and display of Figures of Speech proved effective in utilizing various forms of expression to portray the beauty of musical languages. Through incorporating nature into the performance, the dancers embodied King’s belief that lines are the very foundation of our world, whether it be in thought, time, or nature. And, through their physical discipline, the cast proved their capacity to precisely communicate the nuances of the 14 fading languages. Audience members could enter the show without an ounce of knowledge about these dialects, but exit with an understanding of their cultural and worldly significance. 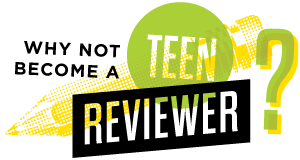 The Teen Editorial Staff is made up of 5 teens who curate the review portion of the TeenTix blog and manage the TeenTix Newsroom. More information about the Teen Editorial Staff can be found HERE. The TeenTix Press Corps promotes critical thinking, communication, and information literacy through criticism and journalism practice for teens. For more information about the Press Corps program see HERE.